04/02/16 -- Soycomplex: Beans closed with small losses. Weekly export sales came in at net reductions of 43,600 MT for 2015/16 - a marketing-year low - and were down noticeably from the previous week and from the prior 4-week average. Reductions were reported for unknown destinations (374,900 MT), China (55,200 MT) and Tunisia (2,700 MT). There were also new crop sales of 65,700 MT and exports of 1,141,500 MT which included China (811,100 MT), Spain (102,400 MT), the Netherlands (73,300 MT), Japan (39,900 MT), and Mexico (28,700 MT). Brazil’s Conab lowered its forecast for the country’s soy harvest to 100.9 MMT from a previous 102.1 MMT, but still a record. Mar 16 Soybeans closed at $8.74 1/2, down 2 1/4 cents; May 16 Soybeans are at $8.77 1/2, down 2 1/4 cents; Mar 16 Soybean Meal is at $267.60, down $2.50; Mar 16 Soybean Oil is at $31.24, up 26 points. Wheat: The wheat market closed lower across the three exchanges. Weekly export sales of only 66,200 MT were a new marketing-year low, and down 78 percent from the previous week and 74 percent from the prior 4-week average. To put that into perspective the largest buyer was Yemen (32,000 MT). Net sales of 87,800 MT for 2016/17 were a bit better. Exports of 230,300 MT were less than stellar once more, being down 26 percent from the previous week and 34 percent from the prior 4-week average. The primary destinations were South Korea (53,400 MT), the Philippines (36,600 MT), Japan (33,000 MT), the Dominican Republic (27,600 MT), Mexico (24,500 MT), and Honduras (19,600 MT). Again all of this re-iterates how difficult the US is finding export homes for wheat, and the sort of orders/destinations that they are having to pick through. StatsCanada reported Canadian all-wheat stocks as of Dec 31 at 20.7 MMT, down 12 percent from a year ago and below the trade estimate of 21.8 MMT. South Korea's MFG were reported o have booked 65,000 MT of Argentine feed wheat at @$180/tonne C&F for March shipment. Mar 16 CBOT Wheat closed at $4.72 3/4, down 7 1/4 cents; Mar 16 KCBT Wheat closed at $4.59 3/4, down 8 3/4 cents; Mar 16 MGEX Wheat closed at $4.96, down 6 cents. 04/02/16 -- EU grains closed mixed, but mostly lower. London wheat got a bit of support from a weaker sterling. 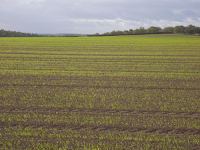 At the finish, front month Mar 16 London wheat was up GBP0.95/tonne at GBP106.75/tonne, Mar 16 Paris wheat fell EUR0.50/tonne to EUR158.75/tonne, Mar 16 corn was EUR0.75/tonne lower at EUR152.50/tonne and May 16 rapeseed was down EUR0.50/tonne to EUR362.50/tonne. The pound was down as ideas of a UK interest rate rise any time soon got pushed even further onto the back burners than they already had been. One leading analyst told the BBC that in his opinion the BoE's understanding of why inflation was so low had been "poor". Deflation, not inflation, carries the greater risk. "I think part of that criticism is about the whole case for forward guidance given the fact we live in a world which is highly unpredictable and where external forces can derail your economic forecasts pretty quickly," he noted. Talking of external influences affecting your market, we've had quite a few examples of those in Ag Commodities in recent years. 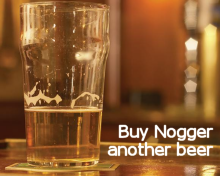 Following China's bid for Syngenta yesterday can we conclude that they are finally relaxing their attitude on GMO's? If they are looking to increase domestic production by going down that route then it could certainly have a negative impact on imports. Elsewhere today, the FAO upgraded world wheat production in 2015/16 by 2.3 MMT on the back of larger than last anticipated harvests in Canada and Russia. Stocks (ending in 2016) were lifted by 3.8 MMT on larger inventories in Argentina, China, Russia and Ukraine -these are now expected to reach their highest level in 13 years, they added. 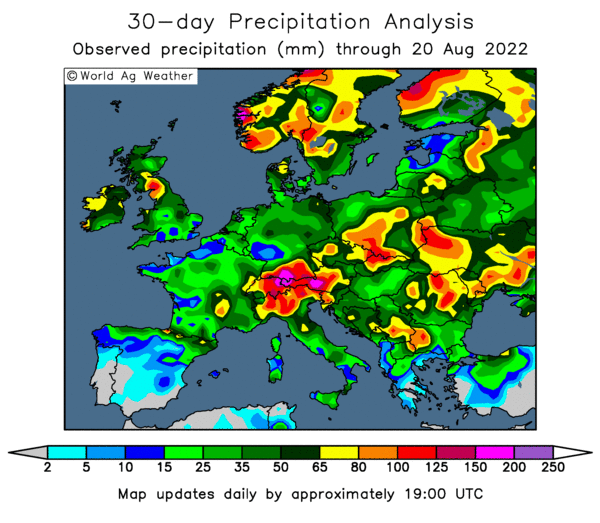 Looking at production prospects for 2016/17 "in the EU, the extremely mild weather of last December delayed the hardening of winter crops and intense cold temperatures in January combined with shallow snow cover caused some frost damage in eastern Europe," they noted. 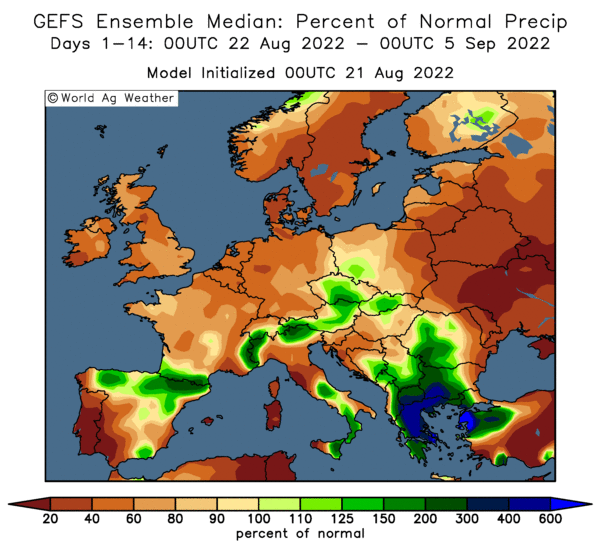 "In Ukraine, there is concern as conditions prior to winter dormancy were worse than average due to severe autumn dryness, which caused planted area to be down. Winter damage will be assessed in the spring," they said. The Ukraine Weather Centre said that current warmer than normal conditions should prevail through to at least mid-Feb. They rate 2/3rds of Ukraine's winter grains as being good to satisfactory, with one third weak/thinned. The Ukraine Ministry said that the country had exported 23.85 MMT of grains so far this season, with wheat accounting for 11.07 MMT of that total, corn 8.69 MMT and barley a further 3.94 MMT. Isreali buyers were said to have booked 80,000 MT of optional origin corn and 18,000 MT of optional feed wheat in private tenders. 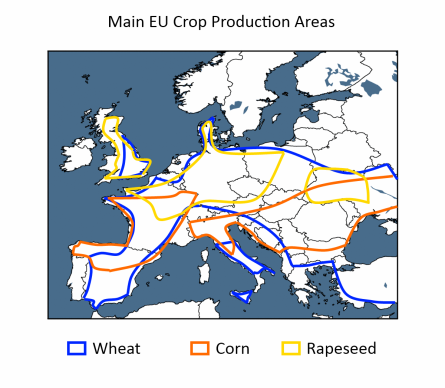 MDA CropCast estimated the EU-28 rapeseed crop in 2016/17 down 11% at 20.46 MMT, with plantings down 3.8% and yields 7.8% lower. Chicago Grains Wednesday - China Finally Embracing GMO's? 03/02/15 -- General: China's state-owned ChemChina agreed a $43 billion bid for Swiss seeds and pesticides group Syngenta today, according to Reuters. It would be "The largest ever foreign purchase by a Chinese firm, announced by both companies, will accelerate a shake-up in global agrochemicals," reports the article. How does this affect China's stance on GMO's? And will it fast-track their approval for a widespread usage in China? It doesn't read bullish at first glance that's for sure. Soycomplex: Beans closed lower, helped on their way by reports that Informa had raised their production estimate for Argentina to 60 MMT, up 1.5 MMT last month. They cut Brazil by 0.9 MMT to 100.5 MMT. Both forecasts are higher than the USDA's current 57 MMT and 100 MMT estimates released last month though. Brazil's Conab are expected to release revised production estimates of their own tomorrow. Trade estimates for tomorrow's weekly export sales report for beans see these continuing to slip seasonally to 400,000 to 650,000 MT. Meal estimates range from 100,000 to 250,000 MT. Chinese New Year begins Monday so their import needs normally start to drop off around now. For the record this upcoming year is year of the monkey - generally considered to be one of the more unlucky ones - perhaps not just what you needed to hear. 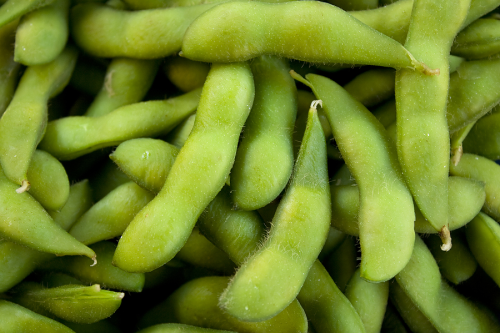 A Monsanto press release said they have received approval from the Chinese government to import its RR2 Xtend soybeans. Mar 16 Soybeans settled at $8.76 3/4, down 9 1/2 cents; May 16 Soybeans settled at $8.79 3/4, down 9 cents; Mar 16 Soybean Meal settled at $270.10, down $4.50; Mar 16 Soybean Oil settled at 30.98, up 19 points. Corn: The corn market closed a touch lower, dragged down by beans. Informa raised their production estimates for both Brazil and Argentina. In Brazil, total production is now pegged at 81.6 MMT versus a previous figure of 81.3 MMT. In Argentina they now go for 26 MMT, up sharply from only 22 MMT last month. The USDA were at 81.5 MMT and 25.6 MMT respectively a month ago. They get a shot at revising those estimates higher next Tuesday. Conab are expected to tweak their Brazilian numbers tomorrow. This year looks like one of those difficult years where yields could easily be spread between "disaster" and "bin-buster" - and not separated by too much distance geographically either, so coming up with an overall overage will be tricky in both Argentina and Brazil. Certainly the latter has been making a new name for itself on the export front, shipping out a record 6.3 MMT of corn in December, up 32% versus November and 85% higher than Dec 2014. The weak Brazilian real and low global freight rates will be helping that cause. Trade estimates for tomorrow's weekly export sales report are 750,000 MT to 1.0 MMT. Mar 16 Corn settled at $3.71, down 1 1/2 cents; May 16 Corn settled at $3.76, down 1 1/2 cents. Wheat: The market closed a few cents higher. Egypt reportedly asked Russia for preferrential payment terms on future wheat purchases. It is also being suggested that GASC will now accept wheat containing ergot levels of up to 0.05% as opposed to "zero" which met with a pretty emphatic response by global wheat exporters yesterday. "Zero ergot equals zero offers," one trader wittily said. StatsCanada are due out tomorrow with their latest Canadian numbers., with trade estimates putting these (as at Dec 31) around 21.8 MMT. US weekly export sales hopes remain a modest 200,000 to 400,000 MT. Informa estimated the Indian wheat crop at 87 MMT, some way below the USDA's current 88.9 MMT forecast. The USDA are out with their February WASDE report next Tuesday, and ABARES are also due with their Australian production numbers the same day. The UDSA's FAS in Russia now has their final 2015 wheat production estimate at 61 MMT, up 3% versus the previous year. Barley output is seen down 15% at 17.1 MMT and corn production up 12.7% to a record 12.7 MMT. Total Russian grain and wheat exports in 2015/16 are expected at similar levels to those last season. May 16 CBOT Wheat settled at $4.83 3/4, up 3 3/4 cents; May 16 KCBT Wheat settled at $4.78 1/2, up 3 1/4 cents; May 16 MGEX Wheat settled at $5.05 3/4, up 4 cents. 03/02/16 -- EU grains finished the day mixed. Mar 16 London wheat took out the previous low, to set a fresh lowest close for a front month since the early summer of 2010. At the close of trading, Mar 16 London wheat was down GBP0.45/tonne at GBP105.80/tonne. In Paris, Mar 16 wheat was down EUR0.75/tonne at EUR159.75/tonne, Mar 16 corn was up EUR0.25/tonne at EUR153.25/tonne and May 16 rapeseed slumped EUR4.75/tonne to EUR363.00/tonne. In London, the May 16/Nov 16 old crop/new crop spread widened further to GBP10.80/tonne. That's a fairly cavernous gap, but not one that looks like narrowing just yet either. How much wider can that go? I guess that depends on cashflow needs between now and next harvest, along with the continued ability to store the 2015 crop once we begin 2016. It currently seems unlikely that, when we get much closer there, that new crop Nov 16 will still command a GBP8.20/tonne premium of GBP8.20/tonne over old crop Jul 16 as it does tonight. One needs to make some sort of a move to meet the other, and old crop rallying much in the face of such large, some would say unprecedented, domestic and EU carryover might be unlikely. We could of course have a crop disaster somewhere around the world by then - it seems like an awfully long time since we had one of those doesn't it? That might help, regardless. Ukraine and Russian weather conditions are turning mild, with snow melting, but few predicting that the winter has ended there just yet. Lack of adequate snow cover at this time of year increases the change of winter-kill as and when harsh frosts return to the region, as they inevitably do, before we can truly say that spring is here. The USDA's FAS in Russia pegged their final 2015 wheat production estimate at 61 MMT, up 3% versus the previous year. Barley output is seen down 15% at 17.1 MMT and corn production up 12.7% to a record 12.7 MMT. They estimate 2015/16 total grain exports at 31 MMT this season, down slightly from 31.5 MMT in 2014/15. Wheat exports will rise 1% to 23 MMT, corn exports increase 18% to 3.5 MMT, but those for barley dip 31% to 3.7 MMT, they predict. Egypt would appear to have shown their true colours: Delaying wheat shipments due to "administrative" problems with letters of credit; rejecting some shipments for failure to comply with contract terms: introducing new almost impossible to stick to new contract terms; and now today reportedly asking Russia if it would like to extend it some "special" extended payment terms (a minimum of 6-months is what I am hearing - presumably in exchange for an already guaranteed ergot-free discharge when the vessels finally do make it port). 02/02/16 -- Soycomplex: Beans closed around 7-8 cents firmer in Turnaround Tuesday trade. ADM said that Argentine growers had been slow to sell stored soybeans, having been a bit more interested in gearing up their efforts on corn and wheat following the December Macri election victory. This is backed up by last week's government numbers showing old crop beans at "only" 85.8% committed. Their soybean hoard is estimated in the range of 12 MMT by ADM, selling of which so far has been "disappointing". This may be because Macri reduced the export duty to zero on corn and wheat but only by 5 points down to 30% on beans. The USDA's FAS in Brasilia estimated this year's soybean crop at 98 MMT, a record but 2 MMT short of the current official Washington figure. They see exports at 55 MT versus 56.65 MMT out of Washington. Oil World estimated the global soymeal crop at a record 216.1 MMT in 2015/16, up 5.8% on a year ago. They expect the downwards price trend in meal to continue, and appear to see meal as the weakest leg of the three in the complex across the coming months. Mar 16 Soybeans closed at $8.86 1/4, up 5 1/2 cents; May 16 Soybeans closed at $8.88 3/4, up 6 1/2 cents; Mar 16 Soybean Meal closed at $274.60, up $3.60; Mar 16 Soybean Oil closed at 30.95, up 16 points. Corn: Corn closed around a cent or two firmer. NYMEX crude settling back below $30/barrel was a drag, but weather conditions in South America are showing subtle signs of changing, possibly suggesting that El Nino strength is wavering. "Weather conditions have been trending drier in Argentina and South Brazil recently reflecting a gradual weakening of the El Nino. Ordinarily a heavy rain maker in the summer growing season December-February. However, areas of dryness have recently developed in Buenos Aires, Cordoba and Santa Fe - the 3 leading farm provinces. Conditions have grown very dry in the past 15 days in Argentina, especially Buenos Aires, the leading farm province and top producer of soybeans and corn. 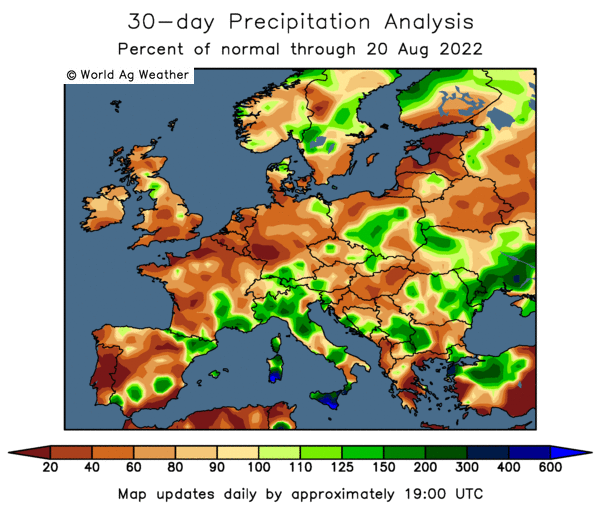 The 30-day rainfall map shows less severe dryness. This suggests that Argentina crops are not in serious trouble yet, still capable of making a good yield if generous rainfall develops soon. January is the main month for rainfall in corn, the period when the crop is pollinating and setting kernels on the ear. The heavier the rainfall, the better. Month-to-date rainfall has been modestly below average not indicating severe cuts in corn production. A bumper harvest is not likely, either," say Martell Crop Projections. Mar 16 Corn settled at $3.72 1/2, up 1 1/4 cents; May 16 Corn settled at $3.77 1/2, up 1 3/4 cents. Wheat: The wheat market closed with little change, failing to hold onto earlier rally attempts. The move higher was probably linked to Egypt who picked up no sellers at all willing to match their new zero tolerance on ergot in their latest tender requirements. The bottom line is that whatever Egypt settle on as a new realistic minimum, other countries besides the US will be able to match it. Other countries with generally cheaper freight and weaker domestic currencies than the US dollar too. So this isn't really a potential door opener for the US whichever way you look at it. Looking at US winter wheat conditions, the USDA have raised good to excellent in Kansas by 1 point from a month ago to 55%, which is 9 points ahead of this time last year. Illinois, with 65% of winter wheat in good or excellent condition at the end of January, up from 58% in late December. Oklahoma fell from 77% to 74% - although that's still the highest rating for the end of January since at least 2010. Japan are in the market for 141 TMT of US, Canadian and Australian wheat for Mar/Apr shipment. Bangladesh are tendering for 50,000 MT of optional origin milling wheat. Mar 16 CBOT Wheat settled at $4.75 1/4, unchanged; Mar 16 KCBT Wheat settled at $4.65 1/4, down 1 /12 cents; Mar 16 MGEX Wheat settled at $4.95 3/4 cents down a cent. 02/02/16 -- EU grains closed mixed, with perhaps the main news of the day revolving around Egypt's wheat tender. 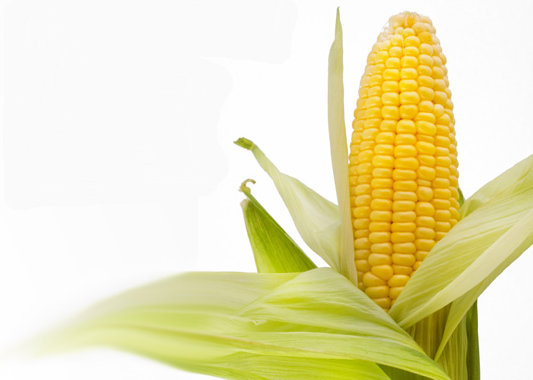 At the finish, Mar 16 London wheat was up GBP0.25/tonne at GBP106.25/tonne, Mar 16 Paris wheat was EUR1.00/tonne lower at EUR160.00/tonne, Mar 16 corn was flat at EUR153.00/tonne and May 16 rapeseed jumped EUR3.50/tonne to EUR367.75/tonne. Egypt picked up no offers at all in their wheat tender today. The apparent lack of interest was due it seems to the recent alteration in the terms of the contract to include a zero tolerance to ergot. Earlier changes to payment can be perhaps coped with, or at least be priced into any offer being made. The chance of suddenly finding yourself with an "afloat" cargo of wheat in the Med suddenly looking for a home is not an appealing one - nor one that is very easy to calculate the cost of when putting up an offer either. The rejection of a 63,000 MT cargo of French wheat this week will have been costly to the shipper concerned, said to be Bunge. Even if world wheat prices are "cheap" the cost of the cargo concerned, arrived in the Egyptian port of Damietta on a bulk carrier, the Amira, on Dec 21 (six weeks ago yesterday), is reported to be around $12 million. A spot buyer will now need to be found for this wheat, meaning an inevitable drop in price as the cargo is now "distressed" even if it conforms to other country's acceptable ergot limits. Interest and freight rates might be cheap too, but the cost of leaving $12 million floating around the Med for a month and a half won't have been negligible either. Freight will have been included in the original offer, but the "demurrage" cost of leaving the vessel loading and waiting around will not be recoverable. So right now, even if they are the largest buyer in the world, Egypt are looking like a risky one from a sellers point of view. This means that new homes might potentially need to be found for whatever wheat Egypt may have ultimately been in the market to buy in the coming weeks/months before a solution is found to this problem. It also keeps sellers of existing contracts to Egypt nervous ahead of their arrival and acceptance, unless they've been formally customs cleared before they sail. 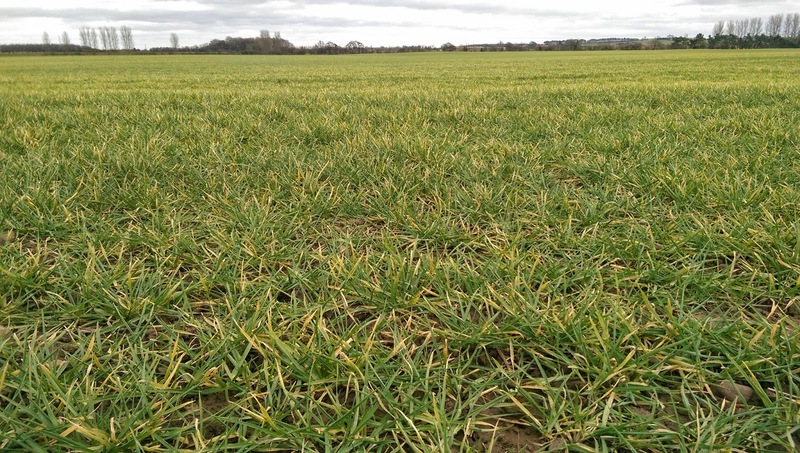 Egypt have already recently stated that they have plenty of wheat bought to last them through to the beginning of their own harvest that begins not too long from now, so the timing of this latest "hard-line" on ergot has obviously been set to suit. In other news, Russia may have raised grain exports in January from the 1.5 MMT previously estimated to around 1.65-1.79 MT due to a late month increase in activity due to talk of a change to the wheat export duty. Some 1.3 MMT of that total was probably wheat, they said. The Russian analysts went on to forecast Feb grain exports at 1.55 MMT, including 1.2 MMT of wheat. Bangladesh are tendering for 50,000 MT of optional origin milling wheat. 01/02/16 -- Soycomplex: Beans closed with small losses. Weekly export inspections of 1.153 MMT were a bit better than expected (800 TMT to 1 MMT), underlying the recent theme. The USDA reported a 167 million bu December US soybean crush versus expectations of 167.7 million. In Brazil, the Mato Grosso soybean crop is said to be 8% harvested compared to 11% last year, with yields improving after a lower start. Mar 16 Soybeans settled at $8.80 3/4, down 1 1/2 cents; May 16 Soybeans settled at $8.82 1/4, down 2 1/4 cents; Mar 16 Soybean Meal settled at $271.00, down $1.40; Mar 16 Soybean Oil settled at 30.76, down 12 points. Corn: The corn market also closed marginally weaker. Weekly export inspections of 681,807 MT were in line with trade ideas. YTD inspections however are still 20.4% smaller than they were in 2014/15 at this time. News out of China’s industrial sector continues to underscore the economic weakness. Little of what corn they do import in 2015/1 is likely to be of US origin. Mar 16 Corn settled at $3.71 1/4, down 3/4 cent; May 16 Corn settled at $3.75 3/4, down 1 cent. Wheat: The wheat market closed around 4-5 cents lower. Weekly export inspections of 281,936 MT were in line with what was expected, and offer little great hope for a pick up in US export activity any time soon. 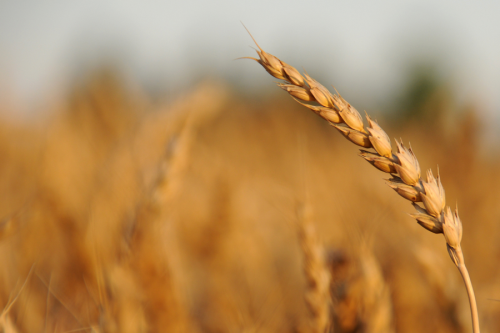 Israel is tendering for 105,000 MT of optional origin wheat. Egypt formally rejected a cargo of French wheat for ergot. GASC tendered for wheat with the results expected tomorrow. May 16 CBOT Wheat settled at $4.80 1/2, down 4 1/2 cents; May 16 KCBT Wheat settled at $4.76 3/4, down 5 1/2 cents; May 16 MGEX Wheat settled at $5.00 3/4, down 4 3/4 cents. 01/02/16 -- EU grains were mostly back in the red again today, save for rapeseed which was mostly a touch higher. 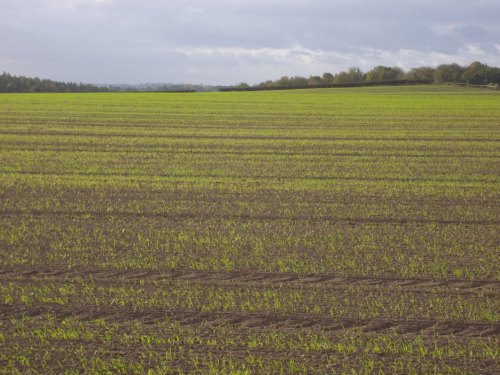 At the finish, front month Mar 16 London wheat was down GBP2.10/tonne at GBP106.00/tonne, Mar 16 Paris wheat fell EUR2.75/tonne to EUR161.00/tonne, Mar 16 corn was EUR2.00/tonne lower at EUR153.00/tonne and May 16 rapeseed was up EUR0.75/tonne to EUR364.25/tonne. Needless to say this was a new all time contract low for beleaguered Mar 16 London wheat, and the contract now stands less than GBP0.50/tonne away from taking out the May 15 lowest front month close since when as it? The summer of 2010 that would be: when Apple released the first iPad; Volcanic ash from Iceland brought chaos to the European aviation industry; Wolves, Blackpool, Bolton and Birmingham City were in the Premier League. Blimey! We must have seen some pretty dramatic changes since summer 2101 then? World wheat production '10/11 was 650 MMT (now 735.4 MMT, +11.6%); world wheat consumption '10/11 was 653 MMT (now 716 MMT, + 9.6%); world wheat ending stocks '10/11 were 198 MMT (now 232 MMT, + 17%). How does the world corn situation look, now compared with back then? World corn production in '10/11 was 835 MMT (now 968 MMT, +13.7%); world corn consumption '10/11 was 853 TMT (966 MMT), +13.2%); world corn ending stocks '10/11 were 128 MMT (now 209 MMT, +63%). So on a global level for both wheat and corn production levels have only increased relatively modestly, and rises have been almost matched by those of consumption. Building ending stocks seems to be the problem, with those for wheat up 17% over the last 5 years (noting that then back in 2010/11 stocks of almost 200 MMT weren't low - they were 30% of consumption). Corn stocks meanwhile have jumped more than 60% during this period, although the levels seen back in 2010/11 were tight representing 15% of global usage. Paris wheat hit fresh contract lows also today, helped on it's way by Egypt confirming that it was rejecting a cargo of French wheat found to be containing ergot. GASC immediately launched a new tender, with the results expected tomorrow afternoon. Who fancies it, and who doesn't (especially given their recent payment problems), and what the prices submitted might be will certainly make interesting viewing. 29/01/15 -- Soycomplex: Beans closed higher on the day, but little changed for the week. A Bloomberg survey into trader/analyst sentiment on beans found: Bullish 2; Bearish 17; Neutral 10; Soybean traders are the most most bearish since August, they said. The harvest there is slowly underway, but should still be record large apart from one or two areas of concern. AgRural estimated Brazil soybean harvest at 4 percent complete compared to the previous year period at 6 percent. US soybean sales meanwhile are starting to tail off. Today's delayed weekly export sales report had these at 647,800 MT for 2015/16, down 34 percent from the previous week and 14 percent from the prior 4-week average. China was the largest buyer (296,800 MT). Exports of 1,323,200 MT were down 16 percent from the previous week and 10 percent from the prior 4-week average. The primary destination was China (764,200 MT). Mar 16 Soybeans settled at $8.82 1/4, up 14 1/2 cents; May 16 Soybeans settled at $8.84 1/2, up 14 cents; Mar 16 Soybean Meal settled at $272.40, up $5.50; Mar 16 Soybean Oil settled at 30.88, up 19 points. For the week, Mar 16 beans rose 1 3/4 cents, with Mar 16 meal down 10 cents and Mar 16 oil up 44 points. Corn: The corn market closed with decent gains on the day, and a couple of cents firmer for the week. Weekly export sales of 817,000 MT for 2015/16 were down 29 percent from the previous week, but up 17 percent from the prior 4-week average. Mexico (304,900 MT) and Japan (245,800 MT) were the largest homes. Net sales of 38,400 MT for 2016/17 were also reported for Mexico (37,600 MT) and Nicaragua (800 MT). Exports of 648,700 MT were up 14 percent from the previous week and 22 percent from the prior 4-week average. The primary destinations were Japan (193,100 MT), Mexico (99,400 MT), Peru (88,800 MT), Colombia (78,300 MT), Saudi Arabia (77,000 MT), South Korea (64,700 MT) and Honduras (23,200 MT). A Bloomberg survey into trader/analyst sentiment on corn found: Bullish 6; Bearish 12; Neutral 11. 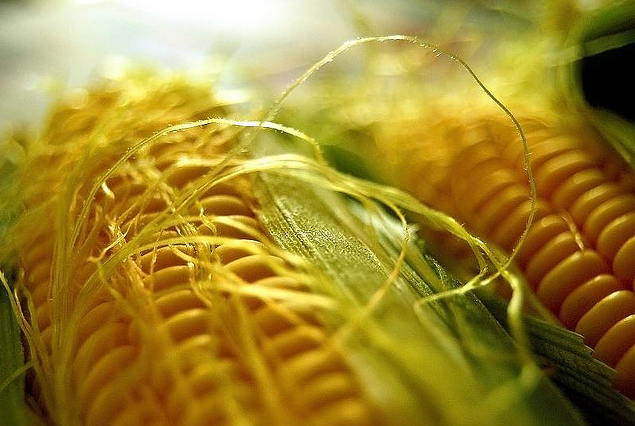 Taiwan has tendered for 65,000 MT of optional origin corn. Mar 16 Corn settled at $3.72, up 6 1/2 cents; May 16 Corn settled at $3.76 3/4, up 6 1/4 cents. For the week, Mar 16 was up 1 3/4 cents and May 16 was 2 cents higher. Wheat: The market closed decent gains on the day, and small ones for the week. Weekly export sales of 294,200 MT for delivery in marketing year 2015/16 were down 19 percent from the previous week, but up 9 percent from the prior 4-week average. That tells you just how bad some recent weeks have been. Increases were reported for Japan (153,600 MT), Indonesia (60,100 MT), South Korea (53,300 MT), Mexico (49,600 MT), Nigeria (47,800 MT), Vietnam (13,700 MT) and Costa Rica (12,600 MT). Net sales of 52,800 MT for 2016/2017 were reported for the United Arab Emirates (25,000 MT), Japan (25,000 MT) and Italy (2,800 MT). Exports of 311,400 MT were up 21 percent from the previous week, but down 7 percent from the prior 4-week average. The primary destinations were Japan (90,400 MT), Colombia (50,000 MT), Mexico (41,200 MT), Ecuador (29,400 MT), the Philippines (28,500 MT) and Nigeria (23,800 MT). Some media reports say that Russian announced there would be no wheat export duty changes, others said no decision would be made until next week. May 16 CBOT Wheat settled at $4.85, up 7 cents; May 16 KCBT Wheat settled at $4.82 1/4, up 6 3/4 cents; May 16 MGEX Wheat settled at $5.05 1/2, up 5 1/4 cents. For the week, May 16 Chicago wheat was up 4 3/4 cents, with Kansas wheat up 1 1/2 cents and Minneapolis adding 2 1/2 cents. 29/01/16 -- EU grains finished the day mixed, with Mar 16 London wheat settling at a news lifetime contract low and at the lowest on front month since May last year. At the close of trading, Mar 16 London wheat was down GBP0.50/tonne at GBP108.10/tonne. In Paris, Mar 16 wheat was down EUR0.75/tonne at EUR163.75/tonne, Mar 16 corn was up EUR0.50/tonne at EUR155.00/tonne and May 16 rapeseed was up EUR0.25/tonne to EUR363.50/tonne. For the week, Mar 16 London wheat was GBP2.20/tonne lower, with Mar 16 Paris wheat EUR0.75/tonne easier, Mar 16 corn down EUR1.00 and May 16 rapeseed EUR0.50/tonne weaker. On the old crop/new crop spread, May16/Nov16 wheat closed at -GBP10.45/tonne tonight versus -GBP9.00/tonne a week ago and -GBP8.50/tonne for the week prior to that. The European Commission raised their view on EU-28 soft wheat exports this season by 1.2 MMT, taking these up to 29.1 MMT. That's 4 MMT down (or -12%) from the record 33.1 MMT shipped out a year ago, but now means that we are now more than in line to match that target using this week's cumulative total of -11.2%. Their estimate for 2015/16 soft wheat ending stocks is now 15.8 MMT, down 1.8 MMT on their previous forecast, but still the highest since 2009, and up 4.8 MMT from the end of last season. The USDA's FAS in Ethiopia said that they expect the country to need to import around 2.5 MMT of wheat this season (Oct 15/Sep 16) following another crop badly reduced by drought. Normal imports would be around 1 MMT. There's talk of a possible Russian announcement on wheat export duty changes on Feb 3.